This is a 12 bar version of the Cornish Top Bar Hive. 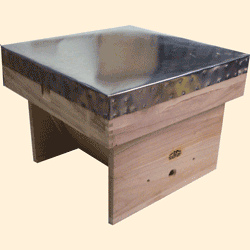 Nucleus hives are indispensable pieces of equipment in the apiary with many uses, e.g. travelling hive, mating hive, swarm collection hive, bait hive. They are supplied assembled and complete. All woodwork is 19mm knot free untreated timber. Roof, metal clad, 4 inch. 12 top bars can be added.